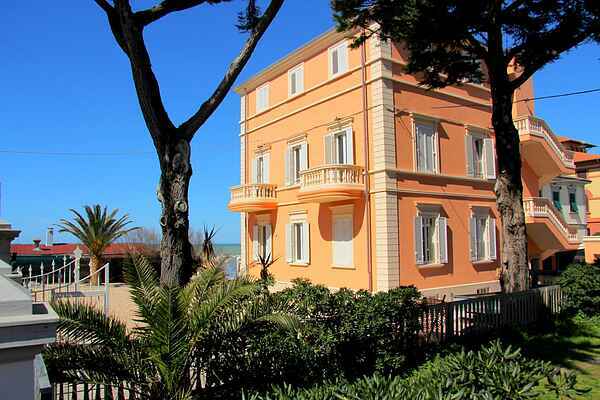 The villa, located directly by the sea and dating back to the 1930s, has been recently renovated by the owners, who occupy one of the floors, with the care and love that a "family home" - which has seen four generations passing through its door - deserves. From the beachfront apartments guests can let their gaze wonder all the way to the Islands of Elba, Corsica and Capraia, listening to the sound of the sea and enjoying extraordinary colorful sunsets. The garden surrounding the Villa, which provides direct access to the sea, offers covered parking spots, a solarium and a gazebo equipped with cabins for beach equipment. Its central location allows you to walk to the supermarket, newsstand, cozy restaurants, pizzerias and various services and shops. Staying in San Vincenzo means sea, culture, wellness, sports, fine dining and much much more. Guests can enjoy the nearby Rimigliano Nature Reserve with its sandy beach and pine woods, Populonia and Baratti (10 km away) with the Etruscan necropolis and the splendid Gulf, Campiglia (8 km away) with the Archaeological Park, and Suvereto (15 km away). Other sites worth a visit are the medieval villages of Castagneto Carducci and Bolgheri (15 km away), famous for the excellent wines and the long avenue of cypress trees. Various art cities are also a short drive away, like Volterra, Pisa, Florence, Massa Marittima and Siena. During summer, visitors can reach many Tuscan islands by ferry, from the port of Marina di San Vincenzo: Elba, Giglio, Pianosa, Capraia and Corsica. Children can enjoy the "Cavallino Matto" amusement park in Marina di Donoratico (9 km away) and the water parks in Cecina and Follonica (30 km away). The area also offers wellness paths at the ancient “Il Calidario" thermal hot springs in Venturina Terme (9 km away) and bike lovers can enjoy a 10 km cycle path along the pine woods. Various events take place in the area between May and September, including recurring initiatives such as the "Festa della Palamita" food and wine festival, the "Palio del Mare" horse race held on the beach (April 17), fireworks by the sea in front of "Villa Corallo" (August 15) - and many more. San Vincenzo, a seaside town on the Tyrrhenian coast, is a tourist center of the Etruscan Coast. Its clear and fine sandy coast stretches for tens of kilometers and is bordered by dense Mediterranean scrub that reaches directly on the beach. An untouched and protected nature features the Natural Park of Rimigliano, located directly on the sea, which is great for wonderful walks in the green. It is very close to Baratti and Populonia, an important Etruscan archaeological area. A few kilometers from ancient villages and medieval towns such as Suvereto, Campiglia Marittima, Bolgheri, Castagneto Carducci, Volterra and San Gimignano. Two of the most important cities of Italian art; Pisa and Florence are at only 70 and 150 km. Other localities can be reached in a short time and of prime importance from a tourist point of view is Elba Island (embarkation at Piombino - 20 Km). San Vincenzo is a well-equipped center for sport facilities, with a wide range of public and private facilities to meet every need. Swimming, fishing, scuba diving, sailing, water skiing, windsurfing: here you can practice all water sports and, in addition, tennis, horse riding and football. San Vincenzo is also just a few kilometers from the thermal springs of Caldana to Venturina. The maritime transport service Acquavision organizes day trips to the wonderful islands of the Tuscan archipelago (Elba Island, Pianosa, Giglio and Capraia) and Corsica (Capo Corso, Macinaggio and Bastia) departing from the ports of San Vincenzo and Piombino.